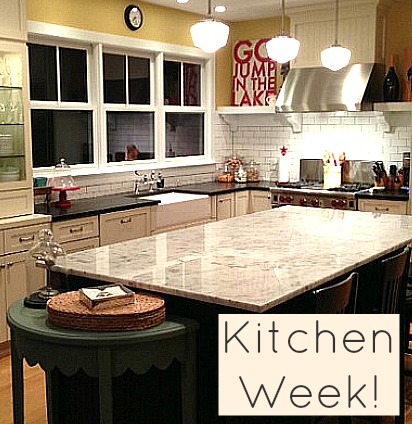 Kelly writes the lovely blog Talk of the House, where you can read more about her kitchen remodel. I don’t decorate my bedroom for Christmas, but this makes me want to! Isn’t it lovely? Very nice! Love the gingerbread houses in the jars! Love it! I kept thinking – wow her house is nice and clean (what does that say about the state of mine right now!? -Last day of school – so have been throwing together teacher gifts, etc.) Just pinned the gingerbread houses in Walmart jars for next year! I pinned the that too! Very nice kitchen. Love the pictures of the kids everywhere! 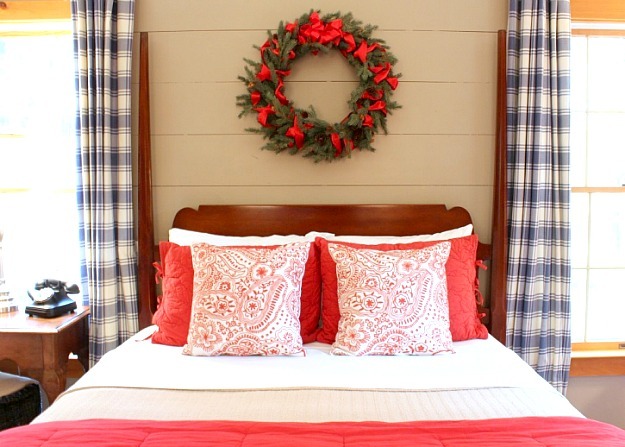 What a beautifully cozy and welcoming holiday home! Thanks for sharing! What a lovely contrast to the overstuffed Gambrel house! Refreshing to hear someone downsize their kitchen from what I characterize as an aircraft carrier kitchen. They are great to look at but they say “Real Housewives” to me. Kelly’s says “home”. 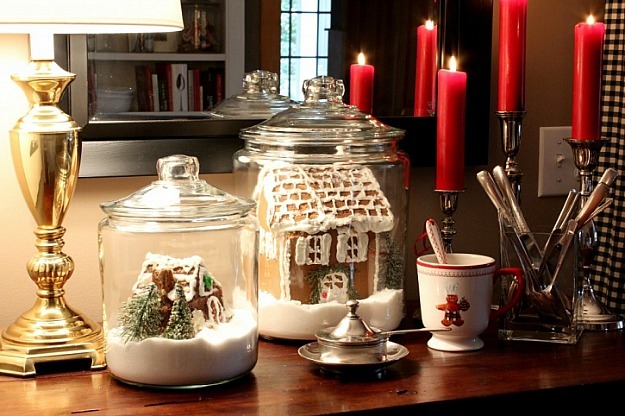 The ginger bread houses in the jars are just perfect. Merry Christmas. 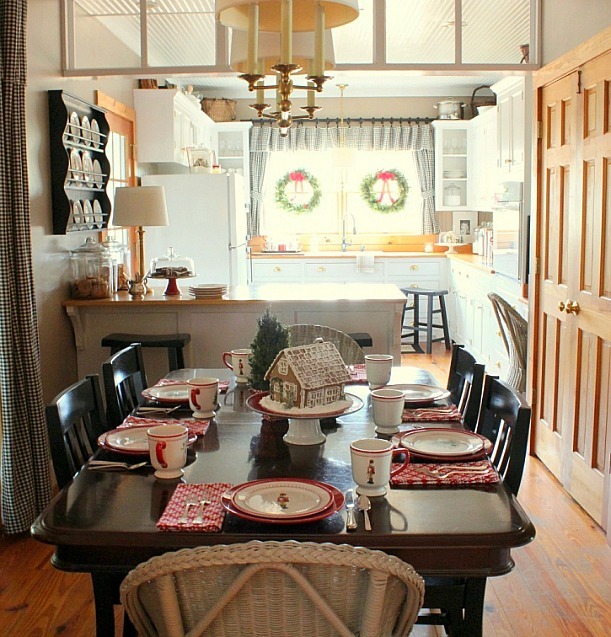 from the first time i found kelly’s blog i have been in love with her house and style plus she’s a real sweet lady too! we hope to meet sometime as she is just a few hours from me…isn’t her house darling? I absolutely LOVE those wooden countertops! This home is so cozy and homey! I love it! The black and white checked curtains are so adorable. 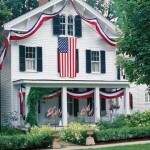 I’d like to see cozy more manageable homes like this one come back into style – and stay there! I love that she downsized her kitchen. So smart! The first thing I always consider when I size up whether a house would be right for me is how easy (or difficult) it would be to clean and care for. I want to live in it, not be a slave to it. I loe that she downsized her kitchen. So smart! She has lots more photos of it on her blog and gives all the details! Great kitchen, I love how homey and welcoming it looks. You can feel it throught the photos. 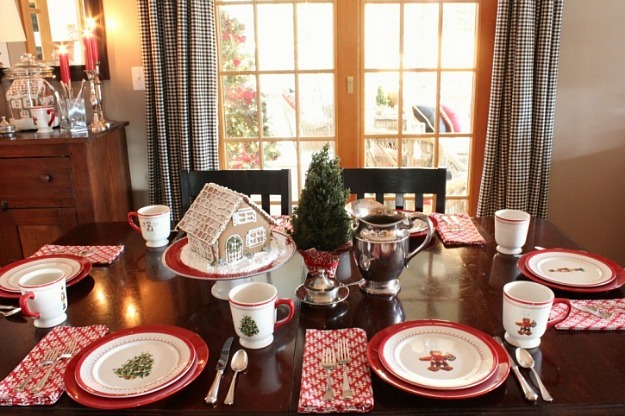 I love the gingerbread house on the footed cakeplate on the table. My wife has one that matches the Snowman cookie jars and large bowl we put out on the counters for Christmas/winter. It is a great way to use something that would not get used much. ps my 4 Shih Tzus got there Christmas-company is coming grooming. They know they will be the center of attention. I know Maizie will be too. Cozy gorgeous home anyway, but all the red touches and greenery are awesome. 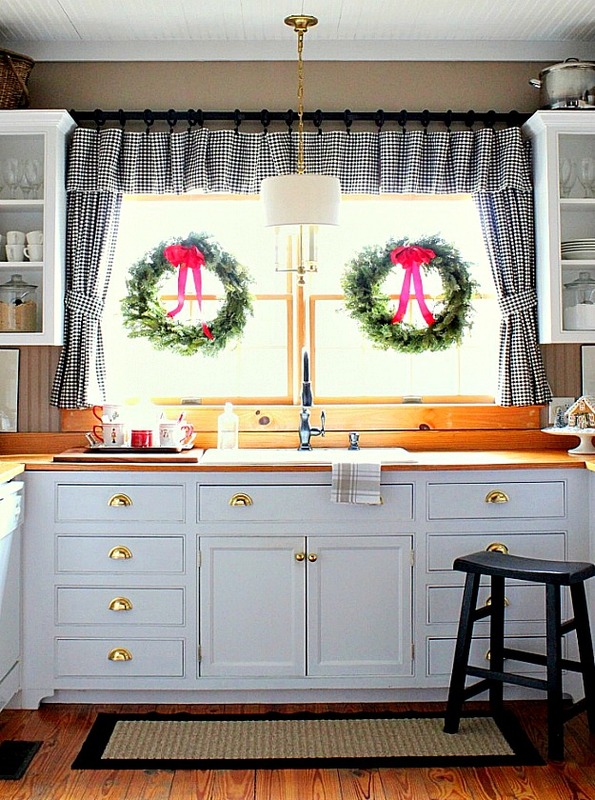 Love the curtains – I noticed she put the rod across the cabinets. Finials and all would have not allowed the curtains to cover the windows well. Good idea. 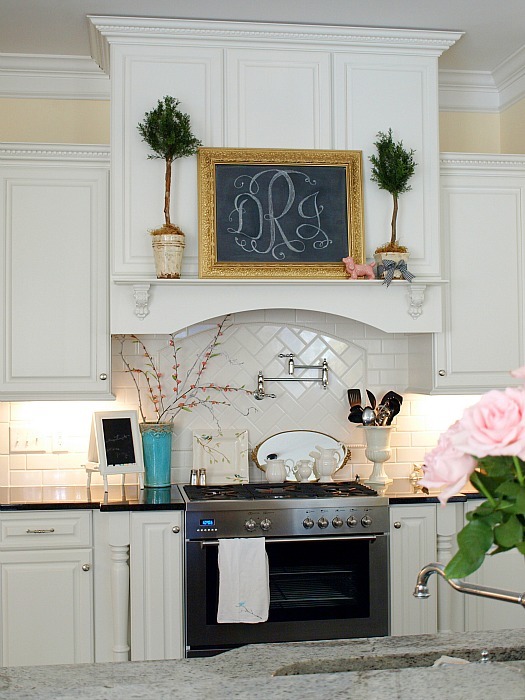 I love this home ~ Kelly has a gift for adding those special details that make her home warm & inviting! Thanks for sharing!! First, I love everything! Such an eye for decorating. I really wish I could put something like this together. What a cute kitchen. Love the little touches of Christmas everywhere. I love those black and white curtains. I love the gingerbread houses in the jars! (How do they fit?) 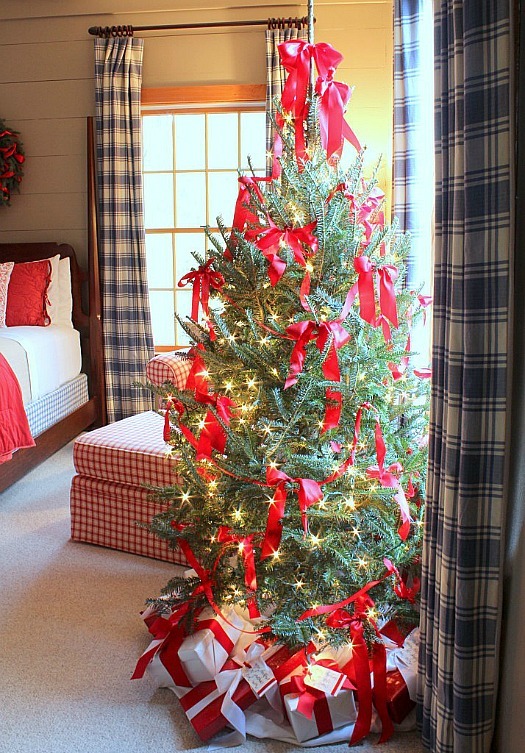 Love that tree in the bedroom too! What a beautiful home! I love the way Kelly decorated it for Christmas. It looks very nicely done. Oh my goodness! What a wonderful surprise!! I teach in an elementary school, and this was our last day before Christmas vacation. Trying to hold the attention of a room full of third graders this close to Christmas is a losing battle. 🙂 So I was more than thrilled to read this. Thank you Julia for sharing the house, and thank you everyone for your sweet comments. You don’t know how much I appreciate them! 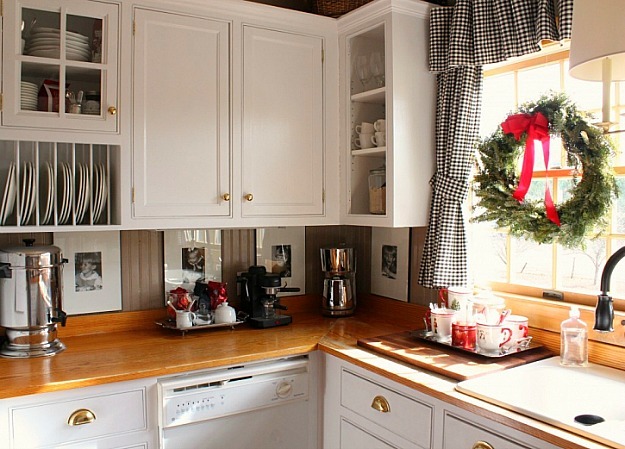 I absolutely LOVE this cozy and inviting kitchen! And I am crazy about black and white check…it’s the perfect backdrop! Every color pops against it. 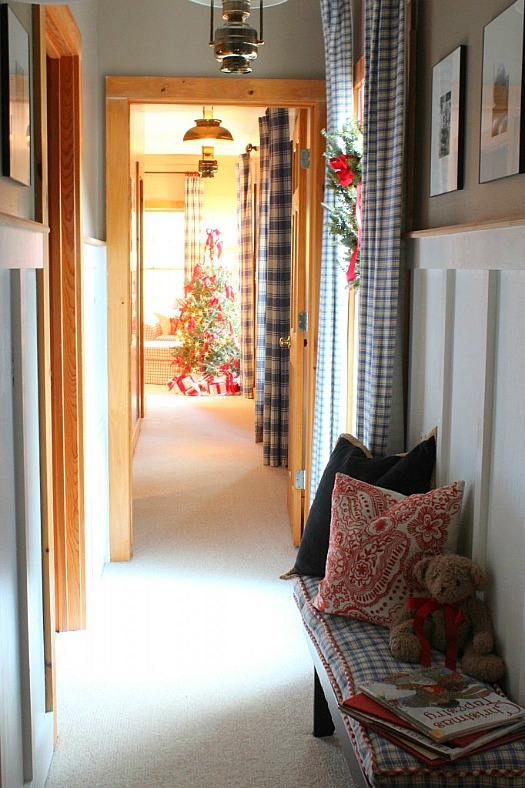 From the peaks down that hallway it looks like an incredibly warm and beautifully done home! I need to check out her site. Thank you once again, Julia! I love everything about this kitchen! It makes me happy!!! Just lovely!! 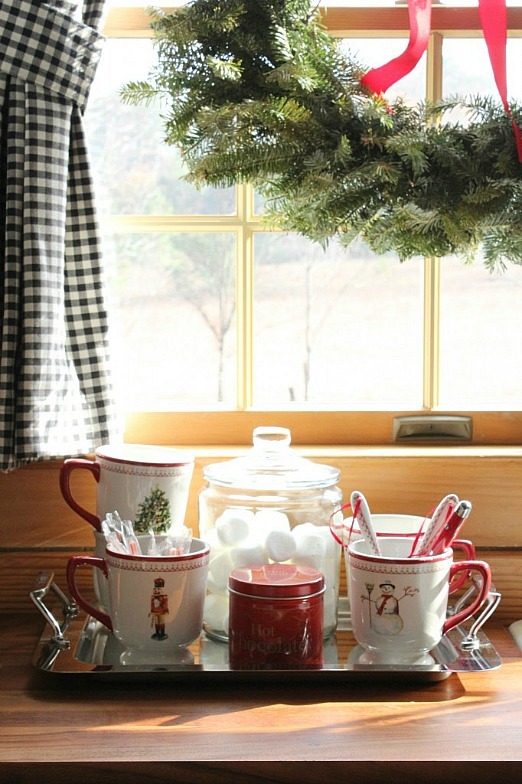 I love the gingham – love the cocoa station and LOVE the little christmas tree. Where is that from? I need to get one! Stephanie, so glad you like the kitchen! If you are asking about the little trees on the table and desk area, those are artificial ones that came from a Pottery Barn outlet 2 years ago. The “branches” on them are made out of a felt type material (and I even cut off little pieces of them to use on some of the gingerbread houses as bushes, trees, and garland.) They have been very handy, but i don’t recall seeing them in PB this year. Maybe they will have them again next year, or perhaps you can find them in a PB outlet now. Thanks Kelly! They are adorable. I will look in PB outlet – but also I’ll know what to look for on ebay! I went to your site and it’s fantastic (and now bookmarked!). I loved your explanation of “Christmas plates through the years” as I have done the same thing. Sometimes I get rid of the plates – and then years later get sentimental and want them back! (Even the “Holly Days” Corelle pattern which was my first set of Christmas plates are ones I long for sometimes.) 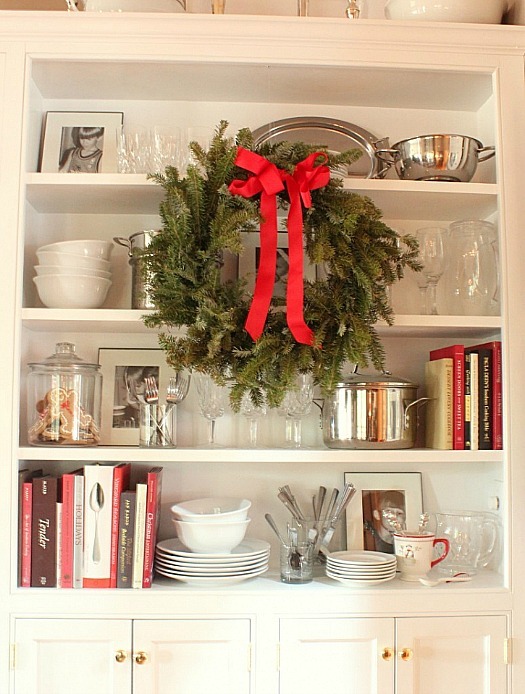 It’s fun to switch out the glasses/plates in December and use them all month. I just love the splashes of red everywhere. Love the wood countertops in the kitchen too. We are going to rip our really old countertops out in January to replace with wood. She has exactly what I want it to look like. Beautiful. So nice to hear that someone else doesn’t think bigger is necessarily better. Usually young couples “upgrade” to a big kitchen. Glad she figured out early that a bigger kitchen can mean just more work. Very charming – and especially gratifying that they did it themselves. Kelly has excellent taste! Love her blog too. Her country cottage in Georgia is neat to see in different seasons. Oh my! I don’t think I could love this home more! Someone shares my love of gingam, I feel like I can’t get enough of it! So warm, inviting and beautiful!!! What a beautiful kitchen. I went to her website and my mouth dropped open at the picture of the outside of her house on her header. Wondering…did she and her husband design the house, or is there a floor plan that the house originated from? Thank you Kelly! That’s awesome that you guys do so much on the house all by yourselves. I am completely in love with this kitchen. Sighing and gawking. It’s perfect. Kelly’s kitchen looks just right to me. I like the smaller is the new bigger trend. We are seriously in fashion now. 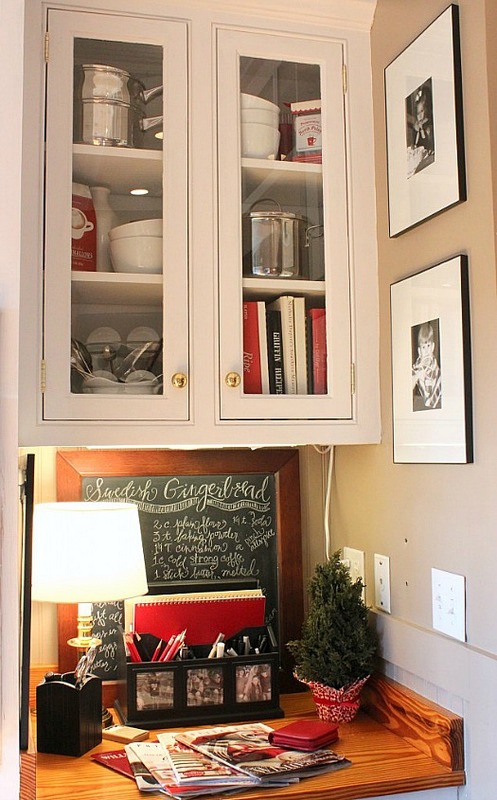 I like how efficient and tight, in a good way, this kitchen is laid out. 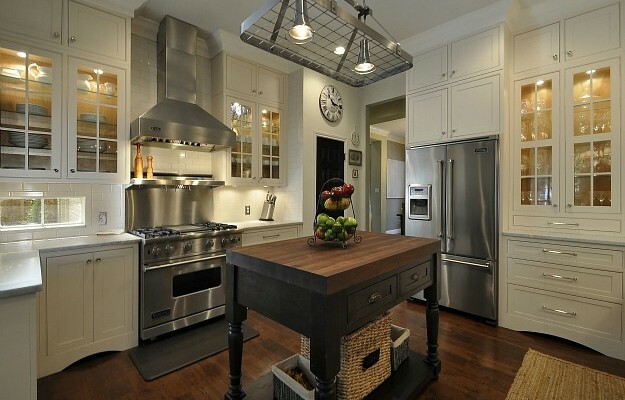 I like that small is the new big… This kitchen is very well designed and laid out. And the white is so charming. We have a varnished butcher block counter bar top and it seems to hold up pretty well. Which kind of amazes me. I really, really love everything! How cozy and elegantly comfy! Lovely home! 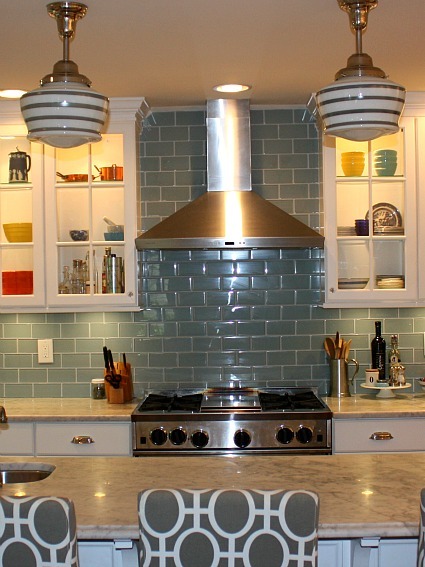 Love, love, love this kitchen! So cozy! I will imitate in the future. I’m a huge follower of Kelly, her home and blog! Hi Kelly! Congrats on being featured!